CREEKSIDE MINISTRIES: A Month Not Soon Forgotten . . .
A Month Not Soon Forgotten . . . If you're a faithful friend around here, you'll know that I've been doing alot of musing recently about our long anticipated move to Cape Cod and my Dad's sudden death the following day. This is grief therapy in action. And you guys have been so overwhelmingly supportive and kind. This is true community in action. Your faithful prayers matter, your words of solace are like great big hugs. I feel heard. I feel cared for. Thank you seems so very insufficient. 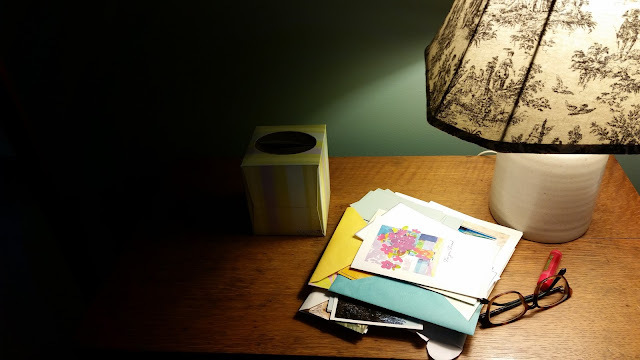 Today I'm turning a bit of a corner as I head off to my favorite month-in-review celebrations over at Emily's and Leigh's where we share the odds and ends of what we're into and what we're learning. Come along with me, will ya'? my counseling clients to other counselors. A prayer-fueled, difficult decision for me and not all that easy for them, these wonderful women deserve the absolute best I can give, and right now that means an introduction to other people helpers who will walk with them on the next leg of their journey. little Tyler's 1st birthday even from afar. God has been sending some wonderful nurses so that his mommy and daddy can get out to church and get a bit of respite from time to time. If you haven't met our 7th grandchild, his welcome-to-the-family video is here ... and you'll understand why this is one fabulous milestone. Heads up - get the Kleenex. far too many boxes and trying to figure out what to do with way too much furniture. Enough already. the greeting card industry and those thoughtful friends who take the time to choose the perfect message and send it my way. 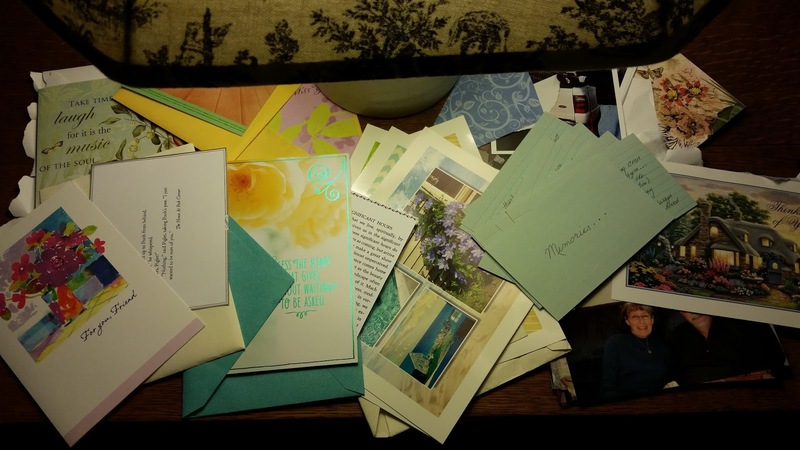 The Friday night small group showered us with envelopes stuffed with memories and photographs and the most beautiful sentiments as we took our leave from New York. And these days, the rusty green mailbox opens to reveal cards that speak a tender peace to my soul. how to make collages with PicMonkey. I had a really cool one just about designed for this post, but it vanished into thin air. Really. Please tell me I'm not the last person on earth to figure this out. lots of my former possessions go to auction this weekend. I've discovered the startling truth that just 'cause you once collected and cherished an object, doesn't mean you have to keep it forever. grace to myself, giving myself some space to do absolutely nothing at all. And when that fails, to go lay down and take a mid-afternoon nap. And not feel a tinge of guilt about it. with the everyday people in my new neighborhood ... the cashiers, baggers, librarians, the woman sitting next to me at an outdoor concert, the re-sale shop owner, fellow walkers, a few people at church. Whoever said New Englanders are standoffish hasn't been to this neck of the woods. on getting my new blog site up and running. Right about now I need to write more than I need to make myself crazy. The thought of wading into any kind of technical detail makes my eyes glaze over. because we finally sold our house this week. No glitches. An appreciative buyer. Thank You, Lord! off to the Adirondacks with Tim, the girls, their guys, and the kiddos for a long-ago-planned week at camp. It's been two years since we took a vacation together. Restful? Hardly. But I just can't wait. With all the overwhelming things happening in your life, it is evident that God is in control. Excited for your move. I'm sure great things await. You hit the nail on the head, my friend. God is in control. And I would have it no other way. When I try to take over His role, it usually ends up in some kind of disaster! I've learned the hard way! I knew I couldn't be the only one! What a beautiful moment of reflection amidst life's challenges. You've chosen a perfect verse to savor. I think I'll be tucking that one away for myself as well. When a verse reaches out and touches your soul deep ... you just KNOW it's been sent by the Spirit as a precious little gift! I'm so sorry for the loss of your daddy. I am so happy to hear you have had the support and love you need during this time. Lots going on, but God has it all in His hands. You're so right! Our lives are in God's hands! Watch out, Linda. PicMonkey can get addicting. Thanks for the heads up, Lyli! It's so easy to get hooked on this stuff, yes? You've been in my thoughts and prayers. I'm so glad to read you are giving yourself the grace and space to take a nap and take care of yourself. Wow, Happy Birthday to Tyler. And I'm so happy to read you will have some time at camp to be with your family...((Hugs))...praying God's peace and comfort for you and your family. You have a lot of transitions to process. Thank you for modeling for us how to grieve...it is hard and holy work. Yes, yes. You get it. I think of you daily and pray that God continues to embrace you with His healing love and comfort. I also try to imagine what it is like to move after so many years and pack up the physical objects as well as all the memories. Thrilled that you get a little respite and change of scenery here in the middle of all the change. Enjoy my friend! You're so kind, Mary! Thanks for continuing to cheer me on! Don't you love that God is still in the miracle working business? As a counselor you know the value of a reprieve. Welcome to the reprieve. Enjoy it. Relish it. And be ready for whatever God has in store for the next journey you take. The value of a reprieve. Yes, Bill. Now to be grace-filled toward myself and live out what I've encouraged others to do along the way. Your pastor's heart inspires me to do what I need to do to heal. I am appreciative! You're a beautiful writer, Linda. Thank you for these gentle reflections! Thanks for jumping in to the discussion, Pam! You know I'm glad you're here! I hope you have a wonderful week at camp! I've always wanted to visit the Adirondacks. If you can ever get here, go for it, Dawn! The mountains are incredible, the lakes filled with reflective beauty. I'm so sorry for your loss, Linda! It sounds like you're taking good care of yourself as you grieve and transition homes. My thoughts and prayers are with you. A great big yes to taking the best care of ourselves that we can, right? We owe that to those who care for us, who depend on us. And we honor Him by doing so. Hi Linda! I had a week at a rental with my daughter and her family, and it wasn't relaxing, but it was beautiful. Making those family bonds stronger in mutual experiences...you could use that now. Enjoy! I am back in time for you to go, oh well. We'll get in synch soon enough. Congratulations on the sale of your house, and on letting go of 'things' you really don't need. Those are HUGE steps. Your heart is in mine, and in my prayers for healing over the death of your precious father. It's a long road, but you'll make it. Just as you pray over reassigning your clients, God prays over you, making you walk the right path to His strength and love. Gosh, Ceil, I am so grateful to see you again. I'm glad, beyond words, that you're back. Thanks for giving us an update on your progress--so much that you are wading through and dealing with, girlfriend! And I'm glad you're giving yourself that break from counseling. You need all the emotional energy you can get at this time. BTW, I pray for your sweet grandson regularly too. Will he go along on the trip to the Adirondacks? What a fun sounding trip! Enjoy yourself and soak in all of the goodness that comes from being with family in such a beautiful setting! Love ya! No, Tyler's not up for any kind of trip just yet ... but I'm betting that he's having a ball with his 'aunties' and the nurses that are caring for him. Emotional energy ... YES! I'm doing what I can to rebuild that storehouse. Grateful that really, God is the One who does that work. I'm just trying to open myself up to what He's trying to mend, what He's gently teaching, what He's longing to offer me. And in the process, would you believe that the worship team is readying themselves for morning chapel next door to the building that we're staying in ... and one of the songs we'll be singing within the half hour is OCEANS! You get me, girl. I'm so grateful. This may just be the bestest month-end post I've read. Maybe because I just believe this is the way our days should be spent. Time for all of the above. And I just love the news of Tyler celebrating his 1st birthday. Rejoicing and continuing to pray for him. Technology wise . . . that's why my blog will remain the same. I don't have the patience for dealing with all that stuff. PicMonkey = love! But Canva, once I figured it out I love so much more than PicMonkey. There are things that PicMonkey does that Canvas does not though so both a great tools. Love you friend. Sending hugs your way. I'm scooping up those hugs with open arms, Beth. Your visits always bring joy! And thanks for letting me know I'm not the only one who's tech-challenged! My new blog will be very very simple. Not a bell or a whistle in sight! Linda, such a powerful reflection of many events that mark your life. First order - Hugs from my heart to yours. Second - we're neighbors at Kelly's RaRaLinkup today. Third - I agree with Simply Beth - Canva is so much easier. Fourth - is your address on the home page correct? I'd like to pop something in the mail to you. I'll be checking into Canva. I'm all about easy right about now! Cool that we're next door neighbor's at Kelly's. She sure throws a lovely gathering, doesn't she? July was definitely a busy month for you, Linda, full of boths ups and downs. Praying for an exciting but more restful August for you! I love Picmonkey, but it never works perfectly for me either. You're not alone. :) But it's still my favorite online photo editor. My computer doesn't cooperate well with Canva. The PicMonkey / Canva debate! Thanks for weighing in, Lisa! What a lovely way to sum a month that could have easily been described in other ways! Your perspective is so encouraging to me, Linda! I am choosing, as much as I possibly can, to have His divine perspective become my earthly perspective. Only by His grace is this happening. He is so faithful, isn't He?! You're sweet to come back and share those hugs, girlfriend! While I'm happy for your move to Cape Cod and settling in. I am very sorry for the loss of your father. Congratulations on selling your house. I'm introverted so I can't go around talking to strangers, it makes me very anxious. But I wish I could be more talkative with people. I guess some people were just born a certain way. Yep, I'm a great big introvert, too, and often find small talk with someone new to be most uncomfortable. And then other times it just seems to spring forth as I focus on the OTHER person instead of my own discomfort. It works! I have only found your blog this morning (as a neighbor at Holley Gerth's Coffee for Your Heart). Just this one post tells me you are going through deep waters. I am praying for you, Linda, and will continue to lift you up. I pray you will be consumed with God's peace and comfort as never before. Blessings to you and your family. Thank you for your beautiful words. I'm just plain grateful our paths crossed this morning, Janet. God is so good to bring just the right souls into our lives, isn't He? You are a lovely gift today! I am glad to hear you are feeling a bit better. A family vacation is just the thing for healing -they make you appreciate what you have. I am a New Englander and I have lived in other parts of the country as well. We are not standoffish as reported to be. In fact, we are very friendly. But, it is a deeper type of friendship. We weather the winters here and you will see, on the Cape, that winters can be quite long. When you see your neighbors again come May you will appreciate their friendship all the more. And, when you see them shoveling the driveway along with you, you will appreciate the comradeship then as well. Yes, the winters are long and still at the Cape, isolated and rather dark. But I love the solitude, the silence, the quiet, the coziness of days indoors under an old quilt, reading and writing the brisk walks with not a soul in sight. Here's to a milder winter than last, yes? I refuse to allow myself guilt trips or pity parties! But instead say 'yes' to being authentically where I am, feeling the feelings, choosing to respond as thoughtfully as possible rather than react without thinking. As much as possible. By His gracious comfort! I love that you're sending some of your possessions to auction with the perspective that you don't have to keep it forever! This is so freeing, isn't it? I can't wait for your new website and I hope you have a wonderful family time during your vacation, friend! So happy for you that you found a buyer for your beloved house! Gee ... these have been busy months. Sometimes it's not til we read what we've written over time that we fully grasp just what life has truly been like for us. And then we're not so surprised when we realize how weary we truly are. Thanks for 'getting it,' Valerie. I'm so glad you're here. So sorry about your dad, and that I'm reading about it now. I've been offline the last month or two due to summer vacation. What a bittersweet move. Each time we pack up I'm reminded all the stuff I think I need really is dispensable. It's a good lesson in letting go. Good luck on the new website, I hope you have someone to help you, technical stuff can be a real pain. So glad you found an appreciative buyer for you home. Enjoy your vacation! How GOOD to see you around again, Alecia! You've been missed, but I hope you've had a relaxing summer break! You've hit the nail on the head with this --> 'Each time we pack up I'm reminded all the stuff I think I need really is dispensable.' Oh so true! Happy birthday, Tyler!! It made me smile so big seeing that, my friend. I love all your revealings here. So glad you are getting out and chatting with the locals :). And I'm thrilled you sold your house. When we moved to our current home over 8 years ago, our old house sat on the market forever. It took a huge toll on us financially and emotionally. I hope you have an amazing vacation with your family, Linda! Looking forward to seeing you soon! I hear you about the huge toll selling a house can have, financially and emotionally, Candace. The whole buying and selling thing isn't for the faint of heart, is it. I'm so relieved and grateful that we are DONE and the house went to a woman who really seemed to love it. Thanks for the birthday wishes for Tyler ... I'll be sure to tell his mama that you dropped by! How did I miss this post ??? I'm so glad you're giving yourself grace, my friend and so thankful for the love that's embracing you just now. The Adirondacks bring back TONS of memories for me! Friends of our had a house on Big Moose Lake and we vacationed there every summer while I was growing up. Hoping to make it back for a visit soon! EnJOY! How cool that you're an Adirondacks fan! What an awesome piece of God's creation ... gorgeous. I hope you guys are continuing to find time for peace, prayer, and grieving as you process both your move and the loss of your dad. Thanks for sharing your journey here in this space! Picmonkey ... you can't save anything? AARRGGHH! That could be a problem, huh?